My Alzheimer’s Smackdown quilt is done! It's finished and I think my quilt is a contender to win the 1st ever Alzheimer's Art Quilt Smackdown (are you listening Hollis, Sue, and John!) It is up to all of you to bid the price of my quilt into a first place win. Ami hasn't given us a date yet, but I'll let you know more as I know more. For now, here's a detail shot of my (winning) quilt. The block is 5" x 5", hand appliqued and machine quilted. Your quilts always put a smile on my face. Their always so happy! And, we often need more “happy” in our lives. Thats why I love to quilt. Its so bright and happy! Would love to win it. Sweet! I love the quilting around the polka dots too. Your block is a winner in my book. 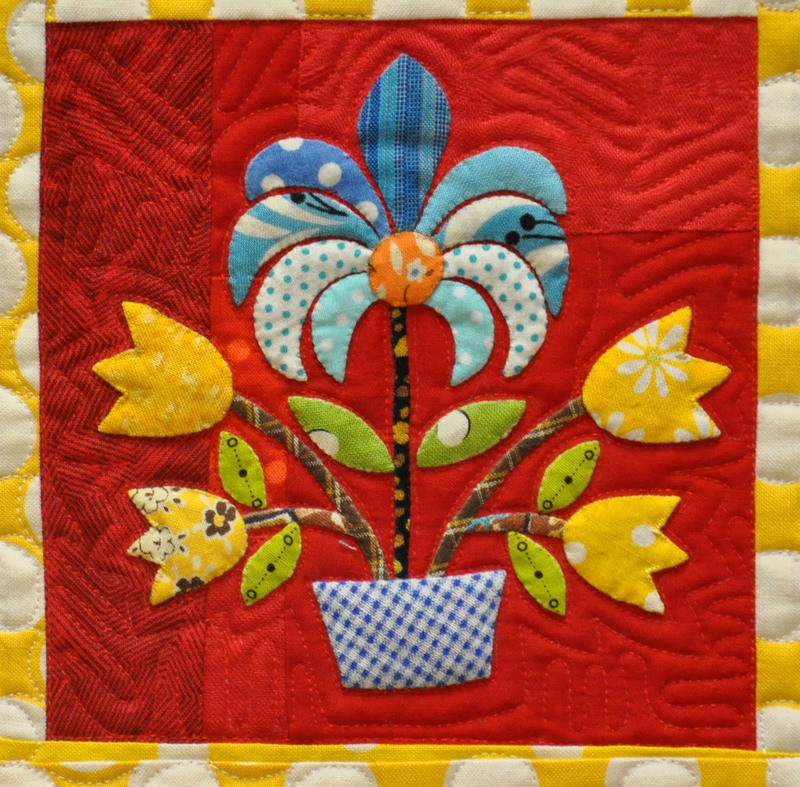 I so enjoy your blog and I love that you are participating in the Alzheimer’s Quilt program. And I agree with the poster who says your quilts make her smile… me too! Wow…love the colors…so little. You ought to show a picture with a comparison to something larger. Those had to be tiny pieces! Great work but no surprise coming from the best in the biz, baby!!! Becky – it’s AWESOME! : ) I will look for it @ Quilt Festival this year!! !